All set for the new season but which division will Banbury United be playing in? Banbury United officials will consider the basis of their appeal for the club being moved into the Midland Division of the Evo-Stik Southern League. Last month, the Puritans were informed they would be in the Southern Division next season, which was more or less the make-up of the division they had been in for the last two seasons. But, following Shaw Lane’s withdrawal from the Evo-Stik Northern Premier League, the FA have made changes. Hednesford Town will take the place of Shaw Lane with United replacing the Staffordshire club in the Midland Division. 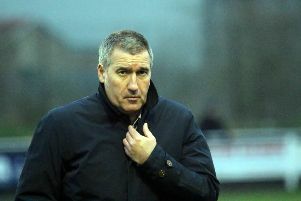 That presents the club with a dilemma as manager Mike Ford has signed several players who thought the club would be playing in the Southern Division. The club is expected to appeal the decision and issued a statement which read: ‘The Board of directors of the club have had initial discussions regarding the information received from the FA yesterday evening in respect of the club being allocated a place in a different division to that previously notified. This has involved manager Mike Ford. ‘There is an opportunity to appeal within seven days of the notification being received. It is the Board’s intention to appeal.